Easy Setup: Connect your computer to your modem or router without cables. Just plug the adapter into your computer's USB port and insert the setup CD, and you’re ready to connect to the Internet from anywhere in your home. Push-Button Security: WEP and WPA/WPA2 security protocols and Wi-Fi Protected Setup (WPS) let you configure and enable security features with the push of a button. 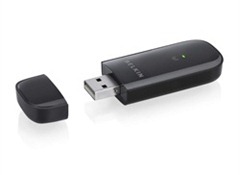 Backward-Compatible: Backward-compatible with 802.11a/g devices at 54 Mbps and 802.11b products at 11 Mbps, the N150 Wireless USB Adapter can connect to older wireless networks and hotspots as well as newer 802.11n networks and wireless-N devices that offer increased range and speed. *The standard transmission rates—150Mbps, 54Mbps, and 11Mbps—are the physical data rates. Actual data throughput will be lower and may depend on the mix of wireless products used.